McLarty Daniel CDJRF of Springdale has a 2019 Ram 1500 Tradesman Edition for sale near Rogers, Arkansas. When you’re in the market for a new fleet or commercial truck, you want a pickup that works as hard and as smart as you do. That truck is the 2019 Ram 1500 Tradesman edition. There’s a reason why Ram has the highest level of owner loyalty of any truck brand in America. Rams just work harder, longer and with less maintenance cost than any other truck out there! 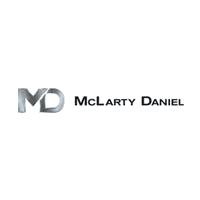 If you’re in the market for a 2019 Ram 1500 Tradesman for sale near Rogers, Arkansas, stop in today at McLarty Daniel Chrysler Dodge Jeep Ram Fiat in Springdale. We have the 2019 Ram 1500 Tradesman on the lot and ready to help you make the workday shorter and more enjoyable. Come in today for a test drive, or check out our big selection of 2019 Ram 1500 models online. WORK-PROVEN DESIGN: While other trucks get ever more “out there” with their design and features, the engineers behind the 2019 Ram 1500 Tradesman know that anything that isn’t useful on the jobsite isn’t really an asset to a truck. While you might not find a power-fold tailgate in the 2019 Ram 1500 Tradesman (seriously: who needs a power-folding tailgate? ), what you will find is excellent Ram styling that will turn heads, from the bold new grille to the work-ready interior with low-maintenance heavy cloth or vinyl, to the extra capacity of the available locking Rambox bed side storage. Available in eight standard colors, the 2019 Ram 1500 Tradesman features a decided lack of bling, with a blacked out grille, door handles, mirror caps, and standard steel wheels in 16-inch diameter for economy when it comes time to buy tires. It makes up for the lack of flash, however, with the strongest frame even installed in a Ram truck, plus a longer cab for more room to stretch out after a long day. The result is a truck that’s built to work and work hard, while keeping you comfortable on the road. WORKHORSE POWER: Whether you need ultimate in full-size truck fuel economy or the ultimate in tow-hungry torque, there’s a 2019 Ram 1500 Tradesman for that, and even a happy medium in between. Standard power under the hood of the 2019 Ram 1500 Tradesman edition is the reliable 3.6-liter Pentastar V6 with variable valve timing and high-tech two-step variable valve lift to deliver a stout 305 horsepower, 269 ft.-lbs. of torque, and up to 24 miles per gallon on the highway. For more power, try the legendary 5.7-liter Hemi V8 with the revolutionary new eTorque system, with 395 horsepower and 410 ft.-lbs. of to tow-friendly torque. With the eTorque system, the standard alternator is replaced by a small generator run by a heavy duty belt, which feeds power to a suitcase-sized battery pack in the rear wall of the cab. When the system senses a need for more low-end torque, such as when you’re taking off from a standing start with a trailer in tow, the generator instantly switches to become a powerful electric motor which can deliver up to 120 ft.-lbs. of torque directly to the crankshaft, for clean takeoffs, even when you’re towing on a hill. 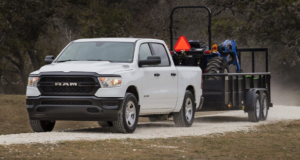 WORK-READY CAPABILITY: As we’ve said, the 2019 Ram 1500 Tradesman is a truck that’s built to work and work hard, and one way it does it is through high technology, even on the Tradesman models. Features like a fully-boxed frame of high-strength steel and available blind spot monitoring with trailer coverage mean your 2019 Ram 1500 Tradesman is a trailer-towing beast that can get the job done in safety and security over the longest of hauls. That’s a good thing, too, because a properly equipped 2019 Ram 1500 Tradesman features best-in-class maximum gasoline V8 towing of up to 12,750 pounds, and maximum hauling capacity of a massive 2,100 pounds, for forklift pallet capacity to help keep trips to the Gettin’ Place to a minimum when you’re on the jobsite. Tougher, smarter, stronger and more attractive than any other Ram light-duty truck before, the 2019 Ram 1500 is already a great truck. The 2019 Ram 1500 Tradesman edition optimizes that great truck for low-maintenance fleet and work-truck duty, with features designed to help you work more intelligently, no matter what the workday brings. If you’re looking to buy a 2019 Ram 1500 Tradesman edition in Rogers, Arkansas, stop in today at McLarty Daniel CDJRF in Springdale. We have the 2019 Ram 1500 in all models and trim packages, including the Tradesman, and our unbeatable hometown prices can help you keep from putting a crimp in your bottom line. Come see us today for a test drive, or shop our big selection of 2019 Ram 1500 trucks online.